No need to go hunting for eggs, just show up and dig into special dishes at Easter brunches happening across Houston on Easter Sunday, April 21, 2019. Whether you’re planning to start brunch at 9am or noon, go for the prix fixe menus or a la carte specials, we’ve got you covered with our guide to Easter brunch in Houston. Easter Brunch Buffet at Cadillac Bar Houston – Hop in for a delicious Easter Buffet at the Cadillac Bar, a Mexican-style restaurant and bar in The Heights. 9am to 4pm. Easter Brunch at Downtown Aquarium – The Downtown Aquarium hosts their annual Easter Brunch with over 40 items to choose from, photos with the Easter bunny, an egg hunt and more. Tickets are $41.99 for adults; $35.99 for seniors 65 and up; $19.99 for kids ages 3 to 10; free for kids under 2. Reservations are required. 10am. Easter Brunch Buffet at The Dunlavy – Head to The Dunlavy for an Easter buffet that will include fruit, seafood, pastries, and other brunch favorites. Cost of the brunch is $70 for adults; $12 for kids ages 12 and under. 10am to 6pm. 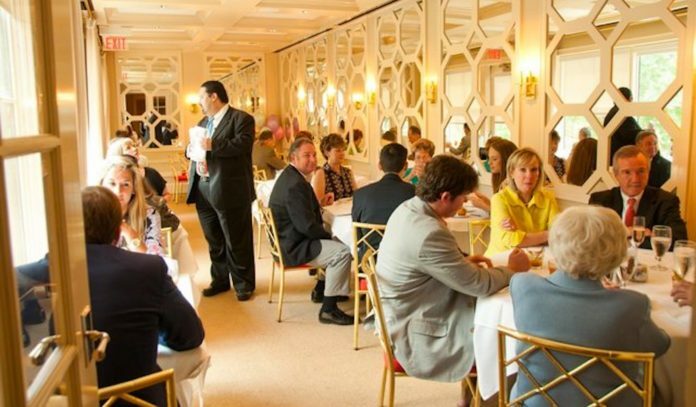 Easter Brunch at Brennan’s – Nosh on a three-course menu of Creole favorites seafood gumbo, crawfish migas, and Brennan’s famous Bananas Foster during the restaurant’s special brunch. $56 per person. 10am to 4:30pm. Easter Brunch Buffet at Mo’s Irish Pub Vintage Park – Mo’s Irish Pub Vintage Park hosts a brunch buffet with a special Easter menu that will include traditional Irish fare along with American classics. Tickets are $19.95; $12.95 for children ages 3 to 12; free for children ages 3 and under. 10:30am to 3pm. Easter Brunch Buffet at City Acre Brewing Co. – Enjoy an Easter brunch buffet along with a beer or mimosa and an Easter egg hunt afterward at City Acre Brewing Co. Admission Tickets are $21.95. 11am to 1:30pm. Easter Brunch at Etoile Cuisine et Bar – Enjoy three courses of authentic French cuisine including crab and lobster bisque, duck leg confit and more at Etoile Cuisine et Bar for Easter Sunday. $52 per person. 11am to 3pm. Easter Brunch at Broken Barrel – Celebrate Easter with a prix fixe brunch menu at Broken Barrel in The Woodlands. The menu includes grilled carrot cake, salmon benedict, a duck “Mc Muffin” and more. $40 per person. 11am to 2:30pm.